I can’t recall the exact work of art that my sculpture teacher in college had been referring to, but during a first year course, he had been telling us about a lovely bird-shaped piece that a friend of his had made. Much to the artist’s dismay, there was no way to display it – a traditional “stand” (of wood or marble) made the sculpted bird look fussy, too precious. After some time he solved the problem by making another sculpture to hold the first one: a nest. It was a stroke of genius, but also born out of a curious mind’s desire to place something adequately in time and space. 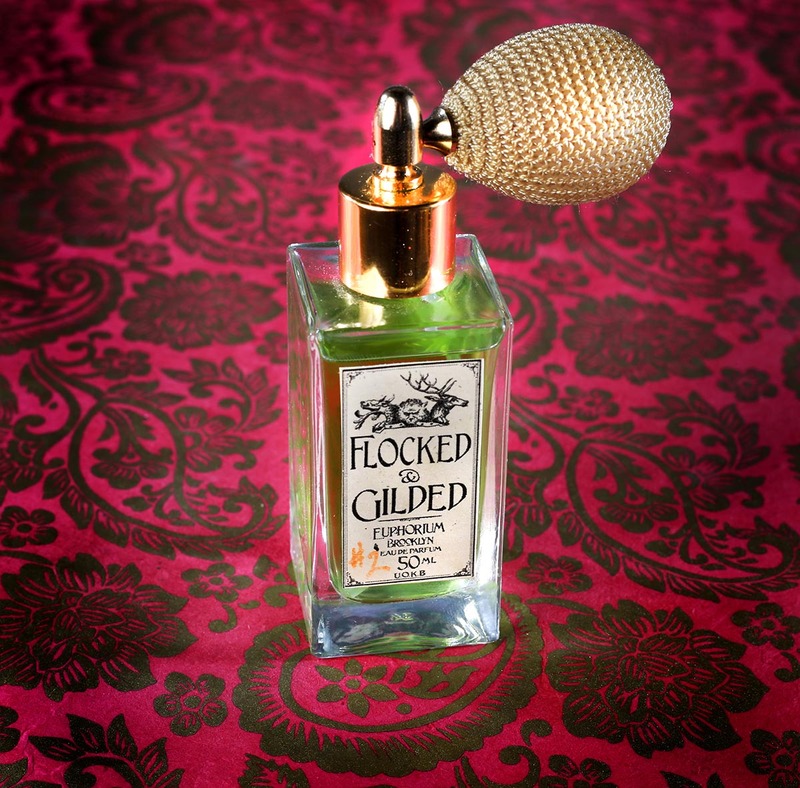 I thought about this story when I was smelling Stephen Dirkes’ latest perfume, Flocked & Gilded, from his rather curious perfume venture Euphorium Brooklyn. Stephen, an artist and filmmaker living in Brooklyn, decided that his experimentation in the world of scent needed to “live” somewhere, to have a backstory that gave it the life it needed. Many small stories came together, a perfume house was born. To an outsider looking in, the brand is ensconced with a kind of elevated steampunk sensoria, an ethos where the mechanical meets the handmade, and the “age of invention” resides in that interesting twilight of modernity and Victorian curiosity. The perfume’s “crest” tells of a fantastical origin, one of Dirkes’ making: three perfumers who began the “works” in Brooklyn in 1860. The three are fastidious-looking animals, Etienne Chevreuil (the stag,) Rudolph Komodo (the dragon,) and Christian Rosenkreuz (the bear.) These three are the fictional but rather inspirational founders of the modern-day Euphorium Brooklyn of Greenpoint. You can see the stylized portraits of these perfumers and creators on Euphorium Brooklyn’s labels, becoming part of a lore that Dirkes loves to discuss, weaving together a long and very funny tale of invention, industry, creativity, and a sort of lopsided cultural advance in the midst of burgeoning urban chaos. By placing the birth of the perfume works in the historical period of the 1860s, it’s at an unbelievably complex period in time. The US would begin its civil war in 1861; by the 1870s, the world would experience the cross-section of Victorian England and France’s Belle Epoque, and the overlapping American so-called “Gilded Age,” perhaps best represented in the expansion of the American railways and the new wealth that came with it. In short, the mid-to-late 1800s were a period of vast change and experimentation, the world opened up, and soon drawing rooms were full of curiosities from the far reaches of the globe. Dirkes has begged us to enter this tufted boudoir of past but with future-peering fascination through the trail of perfume. Euphorium Brooklyn’s perfumes are all opulent creatures; thick, somewhat opaque, but never more so than what you’d see through tortoiseshell. They’re studied, carefully composed fragrances of layered depth and complexity. These traits, in a age that seems to glorify the stripped-down or “bare” aesthetic with such a free pass, are so attractive to the senses. They ask us to slow down for a moment and actually smell quite deeply, to think, and close our eyes. Dirkes' perfumes make time slow down, just slightly. His latest work, Flocked & Gilded, is no exception. It is a rich and decadent perfume of orange and chocolate. I was happy to see the inclusion of chocolate into this scent as it is one of the hallmark notes of Stephen Dirkes’ perfumes. His use of rich, nutty, deep, velvety chocolate (more as a savory than a sweet) also appeared as an unusual mid-to-base note that sprinkles its way through the entirety of his perfume Chocolatl. 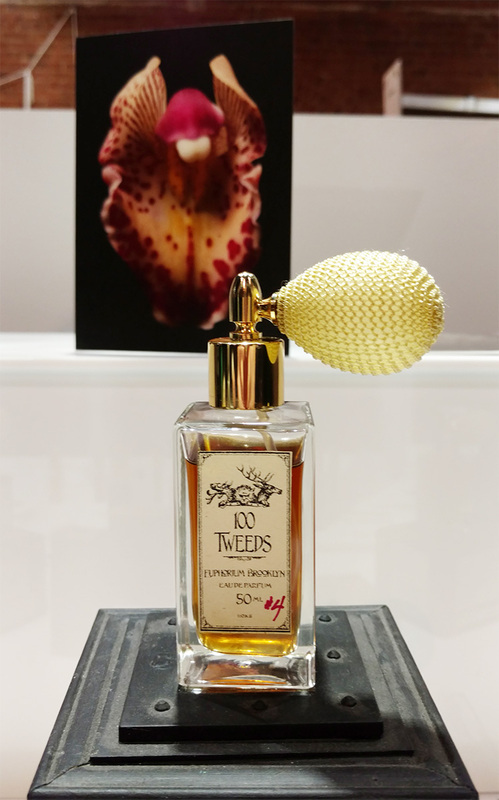 The same richness of base notes is found in nearly all his scents, usually though a combination of leather, soil tinctures, and resins, in perfumes like 100 Tweeds (a personal favorite,) and Wald, where dark, sweet, tree-born substances all give way to a depth of forest experience that retains a lovely sense of air and light. This scent is a exploration of amber and its connection to the tongue, the spots where taste and smell meet. It brings to mind the deeper, more textured reaction we have to chocolate as its treated in Central America; more coarse and rough with a less milky “finish” of process chocolate. Although it might seem elementary, the combination with amber in this perfume is novel and eye-opening. It may be that in Dirkes’ hands, so many smaller distinctions of these smells appear with their small blinking eyes: salty, sage-touched, barely lactonic with a hint of creaminess. 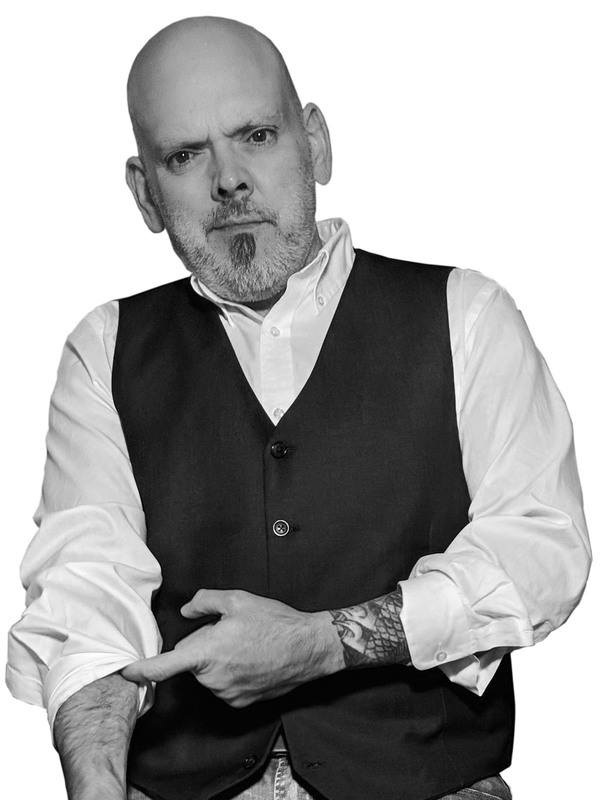 There is a delicate hand at use with deeper base notes like patchouli and vetiver, which are the “sunken ships in the landfill” doubtless helping hold up epic beams above it. 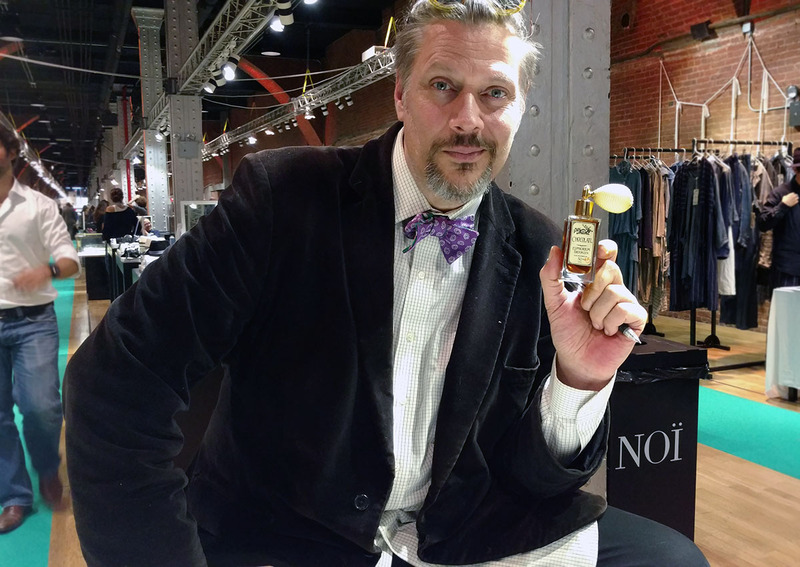 There is a lot happening in Flocked & Gilded, enough that I knew I wanted to ask Stephen many questions, both about his work generally and in particular about this perfume. John Biebel: Stephen, I first met you in New York a few years ago at Tranoï (fragrance event) where you were showing your work, and as I recall we talked for nearly an hour. You are a multidisciplinary artist working in film, writing, and scent, and there also seems to be an element of theater threaded through all the things you touch. What would you say specifically brought you to perfume? Stephen Dirkes: I was first intrigued by the stories of culture, history, and trade that traditional perfumery materials had to tell. I was drawn in further to explore perfumery and building accords because of the story-telling and durational nature of scent. Having worked for years on multimedia art installation, olfaction seemed to be greatly ignored until quite recently. It all makes sense to me in terms of expanding and building on my set of skills as a story teller. Modern opera, film, immersive theatre, and multi media installation are all forms of story telling I enjoy exploring and find greatly informed by perfumery. JB: All of your work seems to reach both forward and backward in time – at one stroke, you're part of a very lively community of new world fragrance makers in one of the world's largest cities, yet your work is often referring to past epochs and "gilded" ages – what do you think contributes to this intriguing duality? It is part of what being alive in this current age does to many artists? 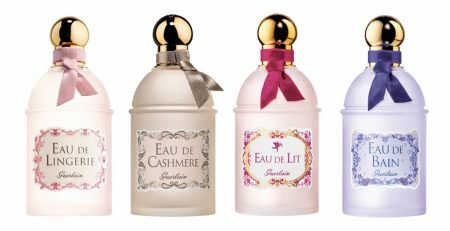 SD: The narrative I began to spin with Euphorium Brooklyn was set in the 1860, so with that determined by the story, everything else came from that in terms of the Perfume House being a bit of a period piece. I’m generally very interested in history and as New York was imploding with violent change everywhere around the 1860’s, it seemed to be a very rich epoch to mine aspects of science, spirituality, and art. Although there does seem to be a fair amount of cultural resonance with the 19th century and Victorian aesthetics right now, the time period is just a detail of the narrative that could just as well be “modern” or “contemporary” in theme. I think historical fiction always offers a mirror to contemporary culture whether by similarity or difference. In the story behind BUTTERFLY EdP, the perfumer references the 18th century pastorale tradition, inspired by pining for a long ago, simple time. I like this as a metaphor for loops of “looking back” and the human need to pine and reminisce. 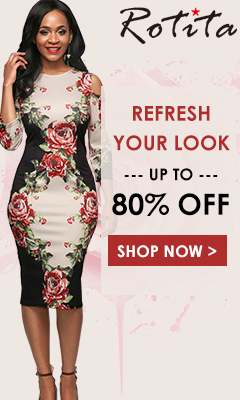 JB: I remember you talking at length about some of the rare and unusual items that you include in your perfumes, what are some consistently inspiring materials that you use? What do they mean to you; what possibilities do they conjure up? SD: I just love the raw building blocks of perfumery. Both complex natural materials and isolated molecules are so inspiring in and of themselves! I’ve gone back-to-basics and have taken a deep dive into Cistus Labdanum, which is one of the oldest and most common perfumery materials, and a fundamental for everything from an amber to leather, fruit, and floral accords. With FLOCKED & GILDED, I really wanted to celebrate a classical “Amber” accord by exploring, deconstructing, and rebuilding a Cistus Labdanum note at its heart. I’m trying to expand the range from sizzling bright citrus (mandarin, blood orange) and rich geranium top notes to honeyed fruits, cream, and dark earthy roots. I could equate it to orchestrating a simple single melody for a big orchestral performance. I wanted dark and rooty vetiver and cypriol to add some richness and complexity to the balsams and woods and help give another layer to the dry down. 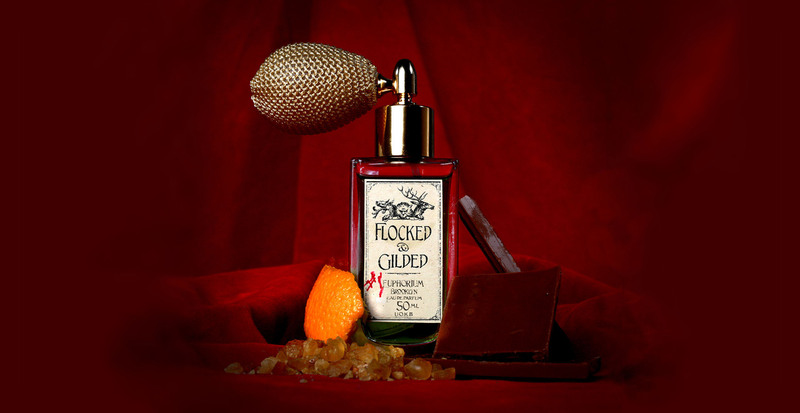 JB: Flocked & Gilded is a particularly lush and gourmand perfume; words that keep surfacing in my mind are curved, plush, saturated. Tell me how your ideas about this scent and the final product merged – was this something immediate, or did it evolve over time? SD: FLOCKED & GILDED evolved very slowly in stages over two years. At its start is my general love of Labdanum and its traditional pairing with benzoin. That’s at the heart of many of my fragrances and is such a rich and comforting base to build upon. I also love an absolute of the flower of the Cistus Labdanum. It introduces a completely new world of bitter, green, floral, pungent, and complex notes. The general idea for an amber accord got to something closer to FLOCKED & GILDED with a bespoke fragrance commission which referenced amber, orange, and cocoa notes. I kept tweaking the formula and expanded on the creamy, milky richness of it an how the fragrance works over time. As a story, the name came from trying to describe the scent in tactile terms. I also liked that the terms referred to visually inspired superficial or surface treatments. Flocking and gilding are very sensual in that they induce a connection to touch in order to please the eye. That Flocked and Gilded also referenced a 19th century aesthetic was a bonus! SD: Yes, I agree with you on the range of good to bad with orange notes (mint is similar that way.) I found that I needed to make a little sub-accord of notes to create a nice, rich, naturalistic organic orange idea. Although I wanted to make a sweet and ripe orange, I needed some bitter orange and pettigran bite to give it some zesty sparkle and “realness” which paired so nicely with the “green” aspect of geranium. Blood orange doesn’t have that children’s aspirin quality a sweet orange does, and it added a juicy richness that connected with the fruity labdanum and benzoin’s vanilla/ root beer notes. I was able to source some great small batch Yuzu distillations from a Japanese distiller and studying the Yuzu really made me appreciate a nice bitter, zesty note in a citrus. These notes helped the orange idea pair so seamlessly with the brighter aspects of the resins I was working with to create a nice transition after an hour or so. JB: I have this idea that Brooklyn Euphorium wants us to delve deeper into the sensual world, would this be an accurate statement? SD: Yes, very much so. My characters are all involved with their sensual/ decadent pursuits with a greater ambition of transcendental knowledge. Often confused, “wrong headed," or comic in their interest in pseudo science and 19th century quackery, they apply a scientific approach to understanding sensuality and sense. Follow @euphoriumbrooklyn on Instagram or Facebook for details closer to the date. JB: What else should we know about Stephen Dirkes? 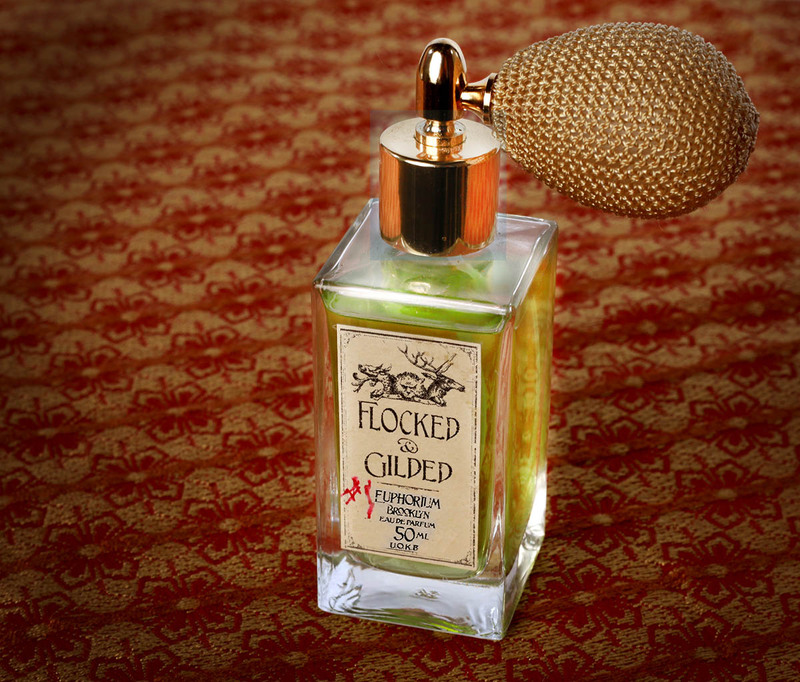 Flocked & Gilded and Euphorium Brooklyn's other scents are available at select retailers and at the Euphorium Brooklyn website.